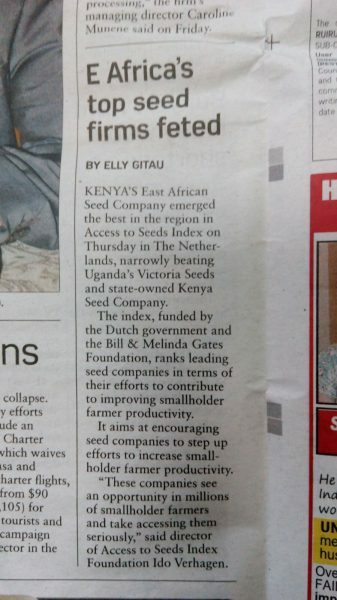 Kenya’s East African Seed Company emerged the best in the region in Access to Seeds Index on Thursday in The Netherlands, narrowly beating Uganda’s Victoria Seeds and state-owned Kenya Seed Company. The Index, funded by the Dutch government and the Bill & Melinda Gates Foundation ranks leading seed companies in terms of their efforts to contribute to improving smallholder farmer productivity. It aims at encouraging seed companies to step up efforts to increase smallholder farmer productivity. “These companies see an opportunity in millions of smallholder farmers and take accessing them seriously,” said director of Access to Seeds Index Foundation Ido Verhagen.